CINCINNATI, Nov. 2, 2018 /PRNewswire/ -- Kroger, America's largest grocery retailer, announced today a partnership to bring Geoffrey's Toy Box exclusive brands to nearly 600 Kroger Family of Stores across America for the 2018 holiday season. Starting this month, Geoffrey's Toy Box branded merchandise and displays will appear in participating Kroger Family of Stores with a selection of 35 children's toys, ranging in price from $19.99 to $49.99. The holiday program will feature exclusive toys from Animal Zone®, Imaginarium®, Journey Girls®, Edu Science®, You & Me®, and Just Like Home®. Product assortment will vary by location. 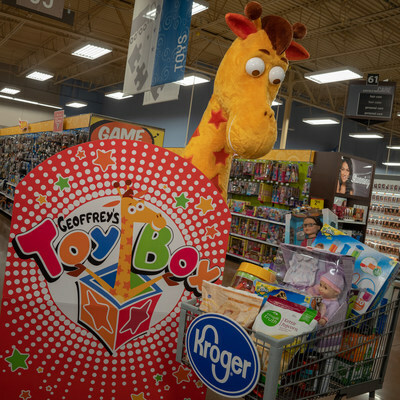 "Geoffrey's Toy Box delivers a unique shopping destination within Kroger stores," said Robert Clark, Kroger's senior vice president of merchandising. "We're excited to offer Geoffrey's Toy Box this holiday season to provide our customers with the opportunity to purchase a selection of toys once exclusive to Toys "R" Us." "We are thrilled to partner with Kroger to bring a curated collection of product from our beloved portfolio of brands to American consumers this holiday," added Richard Barry, EVP at Geoffrey's Toy Box. To view Geoffrey's Toy Box photography and the participating store list, visit here. Geoffrey's Toy Box, a division of Geoffrey LLC, owns and operates a portfolio of more than 20 exclusive brands. A fully outfitted organization with design, development and global sourcing expertise, the Geoffrey's Toy Box portfolio includes trusted brands that kids and parents love including Journey Girls®, Fastlane®, True Heroes®, You & Me®, Imaginarium®, Just Like Home® and more. To inquire about wholesale opportunities, email Geoffrey's Toy Box.